Peat means different things to different people. To many Irish people, it means fuel. To the Scottish, it adds a smoky flavour to their whisky. Indonesia’s peatlands, meanwhile, are widely known as the home of orangutans, the palm oil industry, and the persistent fires that cause the infamous Southeast Asian haze. Indonesians, and other people with ties to these peatlands, have a range of perspectives on the value of peat – both commercial and otherwise. Here we explore them through the eyes of four fictitious but representative characters. Read more: How plywood started the destruction of Indonesia’s forests. Peatland is my land. As migrants from Java, my family now have our own house and our own crops. In some years there have been terrible fires, with smoke so thick we can’t even see the end of our street, and all of our food crops burn. But in other years, the rice and corn grow well, my family eat fish every day, my wife smiles, and our children grow tall. In Java we had no land of our own, and I worked as a farm labourer. Here in Sumatra we have our own peatland. It is different from Javanese soil but we work hard to tend our crops, watering them in the dry season and protecting them from fire. A big palm oil company has trained me and 50 other men from our village in firefighting. We have uniforms and water-holding backpacks, and I have learned about when the fire will come. They are helping us to protect our palms, and their own palms, of course. My palms are still young, but in a few years I will sell the palm oil fruit to the company, and then my boys can go to high school in town – as long as the palms don’t burn, God willing. Floods are a harder problem. How can I protect my land? The government dug canals to drain the peatland before we came, but they are not big enough to hold all the water that comes from the heavens and the floods come more and more often. Peatland is our burden. Indonesia has fertile land, rich oceans… and then there are the peatlands. It is always either too wet to use, or so dry that it burns. Other Southeast Asian governments want us to end the fires and haze single-handed, but Indonesia isn’t the only one to blame; peatland fires are a regional problem. We are caught between domestic and international pressures. Develop our peatlands to lift our people out of poverty, or preserve them for orangutans and carbon storage. Of course, the Indonesian people are my priority. When I studied agriculture at university in Brisbane in the 1990s, my classmates were a little fuzzy about where Indonesia is, let alone what happens here. Now, when our ministry visits Canberra, I feel sad to see “Palm Oil Free” displayed prominently on supermarket products. Westerners don’t understand that not all palm oil is grown on peatlands, that it is a healthy oil and a highly efficient crop perfectly suited to tropical conditions. Oil palms can be grown sustainably and have helped many farmers out of poverty. Nearly half of Indonesia’s palm oil is sourced from smallholders, and losing that income can really hurt them. A palm growing on peatland. Our ministry is working hard to ensure that Indonesia develops our peatlands sustainably, restoring and rewetting degraded areas and working with the local people to find economic uses for wet peat. My son wants to follow in my footsteps and work on peatlands too, and has applied to study sustainable development at university in Singapore. So while peatlands are currently a source of national embarrassment, many minds are focused on transforming them into the goose that lays the golden egg for Indonesia. Read more: Sustainable palm oil must consider people too. Peatland is good, profitable land. For too long we have considered it wasteland – too wet, too far away. But technology from peat-rich countries like Finland and Canada is helping us to use tropical peatlands for people. My pulp and paper company has half of its plantations on peatlands, which produce more than a third of our pulpwood. My silviculture (forest management) team works closely with my environmental manager and PR team to ensure that our plantations are grown according to best practice, and that our shareholders and clients know it. The community benefits in the regions around our plantations are easy to see. The village that my parents came from has electricity now, and big modern houses have replaced the old wooden ones. We have paved the road and our taxes support the government’s new health centre and primary school. We are not a big company like Asia Pulp and Paper, which can afford to retire part of the estate on peatlands, but we do try to abide by the 2011 moratorium on new plantations on peatlands, despite repeated scepticism from environmental groups. Anyway, the moratorium is a Presidential Instruction, and so is flexibly applied. The Indonesian government doesn’t want any more fires, and neither do we – we don’t want our plantations to burn! But the new regulations that require rewetting the peat are a big challenge for us. What will grow in wet peatland? I lie awake at night worrying about my company’s future. What species can we diversify into? Should we move away from pulp and into bioenergy? Are we putting enough money into R&D? Should I spend more on lobbying? My son is studying for an MBA in the United States, but will there still be a profitable business for him to join when he graduates? A youngster in the forest. We rescued Fi Fi from an area that used to be peatland forest but has been cleared for palm plantations. With no food and nowhere to make a nest, Fi Fi and her mother gradually got weaker and weaker, until workers at the plantation noticed and called us. The mother died before we could help her. That was nine months ago, and I’ve been caring for Fi Fi around the clock since then in a babysitting team with my friend Nurmala. Fi Fi loves cuddles, milk and fruit, just like my children did at her age. It is a good job, and we have a great team. 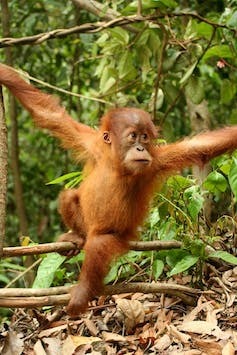 Everyone is passionate about protecting the orangutans and the forest. We would like to be able to release Fi Fi once she has learned all her forest skills. Orangutans can look after themselves from about seven years old. But they need a lot of space. Peatland fires, logging and oil palm planting destroy more forest every year, so places for Fi Fi to be released are hard to find. My brothers and sisters are all happy to stay living near our family home, and when I’m not here looking after Fi Fi, I always have my nieces and nephews on my knee. I love to have them close, but when the dry season fires come and the haze is so thick I can’t even see my brother’s house across the street, I sometimes wish they had flown a bit further from the nest. Last year we were in and out of the health clinic for a month with my niece’s breathing problems. I spend all my time caring for precious little ones – both human and orangutan – but the issues themselves are too big for me to fight. Read more: Good news for the only place on Earth where tigers, rhinos, orangutans and elephants live together. People are central to the problem of tropical peatland fires. In their natural state, tropical peat swamp forests are too wet to burn. Drainage, installed by people for forestry, palm oil, roads, mining and other development, lowers the water table and dries out the peat. Many peat fires smoulder for months, from the start of dry season in July until the monsoon returns in November. These fires have a wide range of negative effects: on local health, regional economies and the global carbon cycle. Indonesia’s president, Joko Widodo, has created a new Peatland Restoration Agency, and announced policies to restrict burning and draining of the peat beyond a maximum water table depth of 40cm below the surface. However, action is still disjointed and ministries are, at times, working at cross purposes. The truth is that only when enough people value wet peatlands will the fires be prevented. Wet peatlands are great for orangutans and the global climate, but how about local smallholders, government officials and business investors? Saving peatlands will require creating value for these people too. What crops can be profitably grown with a water table high enough to prevent burning? How can smallholders tap into a carbon trading market? Rather than cutting trees to send their children to school, can they earn more money by protecting the carbon stored in peat? Can villagers be empowered to make a better living from ecotourism than illegal logging? Humans are integral to Indonesia’s tropical peatlands. And they must be at the centre of the solutions too. Otherwise the fires will keep burning – and none of the four people whose stories we’ve heard want that. 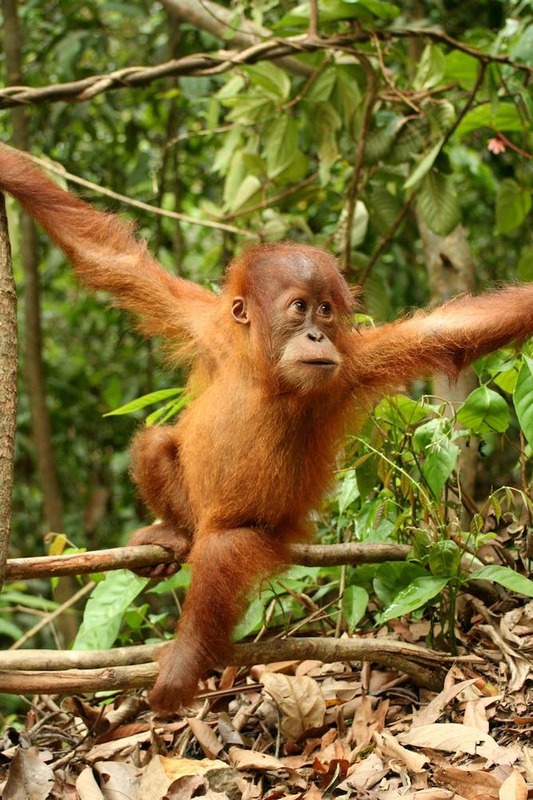 This article was co-authored by Laura Graham of the Borneo Orangutan Survival Foundation and Niken Sakuntaladewi, a researcher with the World Agroforestry Centre. The first images of the impact of fire on the Tasmanian Wilderness World Heritage Area were accompanied by claims from Tasmanian Greens Senator Nick McKim that state and federal governments had ignored warnings from climate scientists that this would happen, and that the fire service had been slow to act. Some 70 fires were started by lightning on January 13 and a further 14 on January 27. 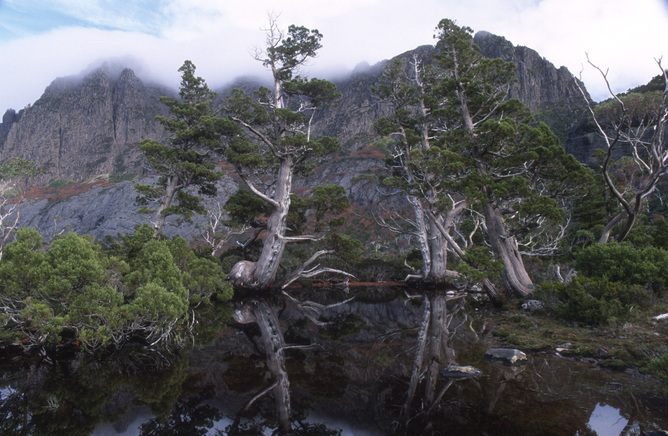 They have so far burned around 100,000 hectares, 17,000 of which are in the southwest Tasmanian Wilderness World Heritage Area. Remote area specialists were sent in early and more flown in from New Zealand. The Tasmanian Fire Service was well prepared, and has stated repeatedly that the government has promised whatever resources they need. However this event suggests more emphasis is required on remote area specialist fire fighting. That’s the policy change this event might precipitate. Fires in wilderness are not just a matter of out of sight, out of mind. Left to burn, they can have a devastating impact on the environment, and indeed on people. On January 2, 2003, one of us (Andrew) on the 6:40 am Qantas flight from Canberra to Melbourne counted 42 tendrils of smoke curling benignly above the tree canopy in the crystal clear air of the Australian Alps, after overnight lightning strikes on the drought-parched bush. Sixteen days later, in much more severe fire weather, some of those fires had joined up and tore into Canberra, destroying 500 houses, killing 4 people and injuring 490. On December 1, 2006, lightning started fires in the Victorian Alps that went on to burn for 69 days, the longest running in the state’s history. Rangers in the Victorian Alpine National Park counted dozens of small fires the next morning but as the terrain was inaccessible, they had to wait until either it rained or the fires reached country in which they could fight them. That Great Divide fire went on to burn 1.2 million hectares of mainly national park. By 2013, 85% of the Australian Alps national parks in Victoria, New South Wales and the Australian Capital Territory had burnt in the space of a decade, seriously compromising the ability of sub alpine forests to regenerate and increasing the likelihood that they will be replaced by more fire tolerant vegetation from lower altitudes. Both the Canberra and the Great Divide fires may have had different histories if water bombing helicopters and highly-trained and well-equipped helitack crews had been deployed the morning after the lighting strikes. While water bombing can never control an intense wildfire, used early with on-ground follow up from elite firefighting crews, it can stop them before they get to that stage. Similar arguments have been made by experienced firefighters in the Institute of Foresters of Australia in calling for an independent inquiry into why the fires that caused such devastation to Wye River and Separation Creek on Christmas Day were not tackled more aggressively in more benign conditions, soon after they started from lightning strikes several days earlier. This is not to be confused with the calls for more large water bombing aircraft, the Very Large Air Tankers, described by environmental historian Stephen Pyne as “primarily political theatre and only secondarily part of fire control”. And it would take more than money and kit. It would first require a change in policy, a different attitude to land management and a different attitude to risk. With growing evidence of more frequent extreme fire weather, that change is likely to be good insurance. Politicians of all stripes are very good at finding hundreds of millions of dollars after devastating disasters, but in times of concern over budget deficits, they appear less willing to find tens of millions for prevention and first response measures. The approach we are advocating here is having more nimble (to use a fashionable word) capabilities in aircraft and highly trained personnel, supported by state of the art scanning, sensing and communications capabilities, to be able to hit fires in remote bush very quickly, while they are small and tractable. Fire-sensitive pencil pines have been killed in the fires. We need a major rethink about wild fire, a story that played out over last century in Yellowstone, the world’s first national park. In the first decades of the twentieth century, naturally lit fires were jumped on as soon as they started. With growing environmental awareness in the 1960s and 70s, the policy changed to letting nature takes its course. That might have been fine, all other things being equal. But they weren’t. Human intervention resulted in wildly fluctuating populations of elk and deer as wolves were removed and the deer and elk ate the country bare to such an extent the beavers up and left. Rivers changed course, cutting into valleys that formerly featured beaver dams, flooded meadows and riparian woodlands of poplar and aspen. So the deer and elk were shot, and a series of wet years led to a massive build-up of fuel. Drought followed, and then in 1988 a series of wildfires burned 320,000 hectares over three months, 36% of the park. It took that dramatic event for the attitude to land management and wildfire to be turned on its head. Wolves have been reintroduced, some beavers have returned, and while this story is still unfolding and there will still be wildfires, they are less likely to be as extensive and as damaging. In Australia, the debate continues on what role land management has played in recent fires. Like the Port Arthur massacre which brought about gun law reform, the black box flight recorder and safety belts, it takes tragedy to bring about major changes in policy and practice. Abstract warnings in the form of models, predictions and forecasts are never enough on their own to produce major shifts in funding or attitudes. A dramatic event is unfolding in Tasmania’s Central Highlands right now. Maybe it could be handled differently next time. That depends on two things. First, the value we as a community place on the fire-sensitive vegetation that has survived in Tasmania in the absence of fire since the Cretaceous, over 65 million years ago, a major reason for south west Tasmania being listed on the World Heritage register. And, second, the federal and state governments accepting their responsibility to protect those values by providing air support, training and resources for remote area fire fighters. This article was updated on February 2.